Tom Price, the Georgia congressman tapped for the nation’s top health job, pressed Medicare officials on a funding change that led to a windfall for the small biotech company run by one of his top campaign contributors, according to a document released under an open records request. Price is facing a Senate hearing Tuesday on his nomination to be secretary of Health and Human Services, a role that would put him at the helm of an agency overseeing billions in spending. 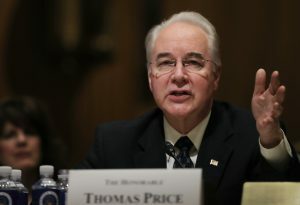 His initial hearing revealed the depth of Democratic lawmakers’ concerns about Price’s investments in health care stocks. The document shows for the first time the nature of the assistance Price provided for MiMedx, a firm in his district that would become a top campaign contributor, seeding his political funds with more than $40,000 in the years since Price directed the letter to Medicare officials. The Medicare letter that Price and seven other lawmakers sent on Oct. 9, 2013, was related to a product called EpiFix, a small graft made of pulverized placenta that’s meant to aid wound healing. Price’s signature is first on the letter, which was signed by five other physicians who are members of Congress. “Any suggestion that his motivations for public service have been anything other than to seek to improve the lives of the American people is simply wrong,” said Ryan Murphy, the HHS adviser, who was previously a spokesman for Price in his personal office and most recently communications director for the House Budget Committee, of which Price is chairman. The company makes skin grafts and injections made of placentas and amniotic membranes, which are meant to help with wound healing. Federal campaign finance records show MiMedx, through its political action committee, chief executive and his relatives, has contributed more than $40,000 to Price’s campaign and joint fundraising committees since 2014, with contributions starting six months after Price sent the letter. With combined PAC and individual donations, the company was ranked as Price’s top contributor for 2015-2016 by the nonpartisan Center for Responsive Politics. The 2013 letter to then-Medicare administrator Marilyn Tavenner has strong echoes of the same concerns MiMedx executives were airing at the time. It touches on the issue of “waste” in the use of oversized grafts used to help heal wounds around the ankle and on the feet of people with diabetes. The letter says $75 million in wound grafts were wasted in 2011 because of an inefficient pricing model that paid for sections of graft that were being thrown away. It encourages Medicare to move to a new, tiered system of reimbursing for the wound grafts. Also that October, executives briefed investors on concerns that resemble those detailed in the lawmakers’ letter. The earnings call transcript said competitors’ grafts result in “massive wastage” that they estimate at $100 million, given that 80 percent of competitors’ grafts are discarded. It wasn’t long, though, before MiMedx had great news. During a Dec. 5, 2013, call with investors, the company reported that Medicare changed its wound payment policies in ways that exceeded its expectations. The changes include ending the waste and moving to a tiered payment system. Executive Bill Taylor estimated that doctors can pay the company $318 for a sheet of EpiFix and then bill Medicare for $1,371.19 in reimbursement. The result: Doctors who use EpiFix on patients would be able to keep about $1,000, a strong incentive to use the graft. “It’s a real win for MiMedx,” Petit told investors. The company has seen significant revenue growth, reporting in a press release that its income for 2014 — the year the Medicare pay change took effect — was $118 million, double the amount it earned the year before. Company executives have told investors the advanced wound care market is expected to be worth $1.25 billion in 2018. Earlier this month, Kaiser Health News reported that Petit urged employees in 2015 to contribute to its PAC as he was publicly pressing the Food and Drug Administration to change its stance on the regulation of the injection. An email from Petit’s address sent to managers demanded donations “IMMEDIATELY” to the company’s PAC, according to documents reviewed by KHN. The ongoing FDA scrutiny could potentially affect the company’s bottom line or lead to a recall of their injectable wound-care products, the firm told investors in 2013. The FDA declined to say whether it heard from Price about the company or to answer questions about its review of MiMedx products. Petit, a prominent businessman in the Atlanta suburbs, served as a Trump campaign finance chair in Georgia. Petit said he and his wife saw Price and his wife at an inaugural event but did not discuss MiMedx.